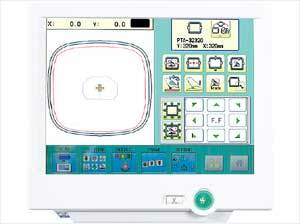 HCR2 1506 has 6 heads, 15 needles, 12.5x12.5 inch field, 1000 spm, color LCD touch screen, USB port, network port, 220 Vac. Happy HCR2-1506 15-Needle 6-Head Embroidery Machine. The HCR-1506 is one of the most popular HAPPY multi-heads in the HCR-series lineup, thanks to their unique combination of versatility and production power. Imagine finishing a dozen pieces in just 2 short runs! And thanks to their heavy-duty construction, all HCR multi-head embroidery machines are "HAPPY" to run non-stop for your embroidery production needs through the most demanding production cycles. Key Sewing Information At A Glance. Built-In Networking And USB Ports. Customize Home Screen With Apps Used Most. On-Board help and auto-error correction. Large 10.4 inches color touch screen control. Included HAPPY LINK and LAN software for direct PC connection. 40 million stitch memory, organize designs in folders, pull designs from remote PC. Make Design Adjustments On-The-Spot: flip/rotate, auto-repeat, fine-scaling, offset from center, and more. Improve sewing quality of existing designs with design cleanup/compensation tools. Improved production power: higher speed operation, fast color change. Automatic production and error reporting. Quick detachable support table (shown). 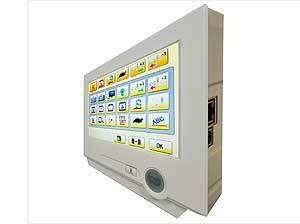 Happy HCR2-1506 Color LCD Touch Screen. Multi-Head Machines have a 10 inch touch screen panel that is packed with features! The 10 inches touch screen has a vivid LCD interface. Easy Design Placement - Shows hoop as related to the design. Displays your key sewing information at a glance. Customize your screen the way you want. Easily place the Applications that you use most on the main screen. Full Built-in Networking and USB ports. Auto Error correction for the most common issues. Advanced Control over every aspect of your sewing experience. Configuration: 6 heads, 15 needles per head. Memory capacity: 250 designs or up to 40 million stitches, 99 color changes per design. Embroidery Sewing Field Per Head. Max needle distance: 450mm x 360mm (17.5 inches x 14.2 inches). Tubular frame field: 320mm x 320mm (12.5 inches x 12.5 inches). Ballcaps: 80mm x 350mm (3 inches x 14 inches). D1=800mm/32 inches with table removed. 62 inches with thread rack. 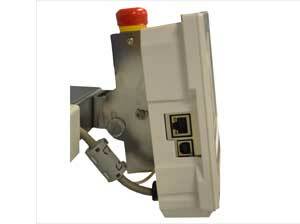 Power type: 220v Single-phase, frequency 50/60hz.